Abstract: Downloading an object over the internet through a standard web-browser is a mechanism that is ‘less-than-optimal’ for the delivery of archival objects. Download of objects will not preserve the file-system metadata of the object. Tools like Wget can do this, but do we want the same behavior of the browser? On answering that, do we also need to create mandatory new requirements in future digital preservation systems? The repatriation of modified dates with born-digital records, for example? Or the maintenance of that information with the object across its lifetime; from deposit through to delivery? This blog entry attempts to ask this trail of questions, each of which we would need to solve one-by-one, before asking the reader – what behavior do you see, or have you implemented in your digital preservation system? – What behaviors do you think are important? It’s a small thing, something at the infra-red end of the spectrum of digital preservation or digital archiving – deep in the bowels of the minutiae that, perhaps, in-general, we’re not trying to solve each day. Find a file on the internet – maybe even via your own catalog – download it and then look at the file-properties in your operating system – what date does it say? – When did it first get put into the repository? The last-modified date of any digital object, while not the definitive measurement of whether a file has changed or not, is often the first, and only clue we need in a business environment to understand if a file has been modified or not (an environment where we’re not considering digital preservation or the potential for digital forgeries, daily). What happens when we deposit a file into a digital preservation system? 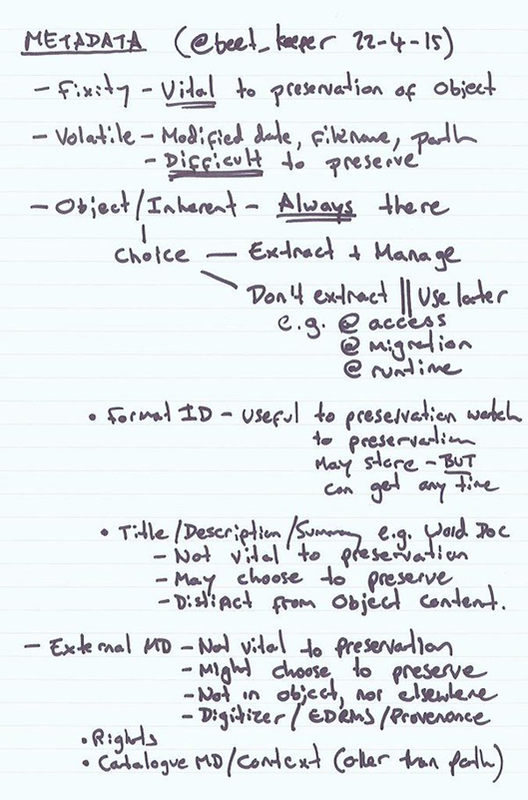 A number of things will happen to an object along a standard digital preservation ingest workflow. The original modified date will be recorded in system metadata. This is how your end user will casually assure themselves that the file is what they expect it to be – that it hasn’t been modified since the depositor last did. A checksum will also be generated and recorded that will demonstrate definitively that the object they are looking at is the same as was transferred into the organization’s custody. In some digital preservation systems a filename will be given to the object on ingest. What we see on delivery is often the original filename repatriated with that object on request. In other systems a catalog reference may be used for the object on delivery and so the original title is not re-associated. It will depend on the requirements of your system and how they’ve been encoded in technology. What’s the difficulty with some metadata? The modification date of a file is volatile metadata – volatile in a sense that it is file-system metadata and it changes with every addition to a file, i.e. a file is edited and the checksum changes. It is also volatile in a sense that unless you are looking specifically to preserve this information it can easily be lost. Tools like rsync exist, the -t, –times flag transfers file system dates along with the object during a data transfer to a remote system. In this case, the filename in the system is the same as its persistent identifier in the system FL25298512, the name appended with the extension .ppt. Its new modified date can be seen in the object characteristics – this date aligns with the fact that this file was deposited 18 September 2015. This file was deposited as ‘Digital Future Summit-video.ppt’ and was last modified 23 November 2007. After deposit, the file becomes intrinsically linked to the preservation system’s metadata (Note: The file may have been deposited with other metadata, e.g. 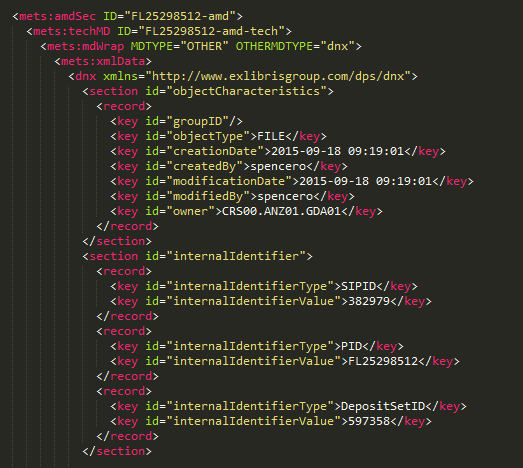 from an EDRMS) – the volatile file-system metadata of this object is now externalized. What happens to the object now? We’ll jump to the end of the process – further management and preservation happens but is out of scope for this blog n.b. <!–preservation happens here–> – the two parts of the process that I want to focus on for this entry are deposit and delivery. The record I’m using in my examples has the catalog ID: R24991813. The request and response is pasted, as-is, including typographical errors at the time of writing. It is unlikely that the majority of browsers will be able to display this content, and so in most cases, a download dialog will appear. The second parameter of the Content-disposition string is responsible for repatriating the object with the filename recorded in the digital preservation metadata. 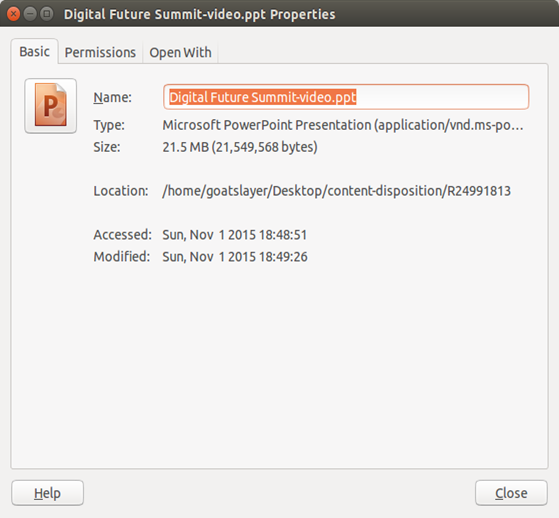 In this case replacing the preservation system adopted filename, ‘FL25298512.ppt’ with ‘Digital Future Summit-video.ppt’. This is not the object we put into the system, at least something has happened to it, however slight. Perhaps a more appropriate phrase is that this is not same wrapper that belonged to the original file on deposit. Is this the solution we want? Without focusing on any preservation system in particular, I have been attempting to try and understand the life-cycle of a digital object from ingest through to delivery to try and understand requirements. I want to understand if it’s the preservation system’s responsibility to automatically record the data attached to an object given to it, and where it needs to record it, i.e. is it data that we provide the SIP ourselves or should it be extracted by default (automatically)? Does the system have a responsibility to record provenance for itself, i.e. record the state of the object as it was received so it can be compared to the SIP and the processes enacted on the archival object? To expand more – for provenance, if a filename changes in system – have the system acknowledge in metadata that it has changed the filename, if a datetime change occurs (as in this case), have they system acknowledge in metadata that it has changed the datetime, and the reasons for why. We control as much of the environment surrounding a physical archive as possible – preventative conservation – why might we not do this for a digital archive? – Perhaps the specific use-case I’m questioning here is borne out of a lack of control over our web browser? There is a thread in the Firefox Bugzilla database that was discussed over ten years from 2002 to the year 2012: https://bugzilla.mozilla.org/show_bug.cgi?id=178506 the most recent update is that it is RESOLVED WONTFIX. The behavior of Firefox is consistent with other browsers: As we saw above. When you attempt to download a file over the internet the date it will arrive on your PC with is today’s date, both for creation and for modification. The tool’s documentation suggests that it has step to repatriate the modified date with the object after download. I wanted to be sure that this was a browser limitation, to try on other browsers, and to see if I could influence the behavior to see if there was a configuration on the web-server that I had been missing. I also wanted to generate the evidence required to demonstrate to the vendor the possible configurations that could be provided to users to have greater control over delivery, including potential delivery of the modification date. The code can be executed by building in Golang, and then running the resultant executable. 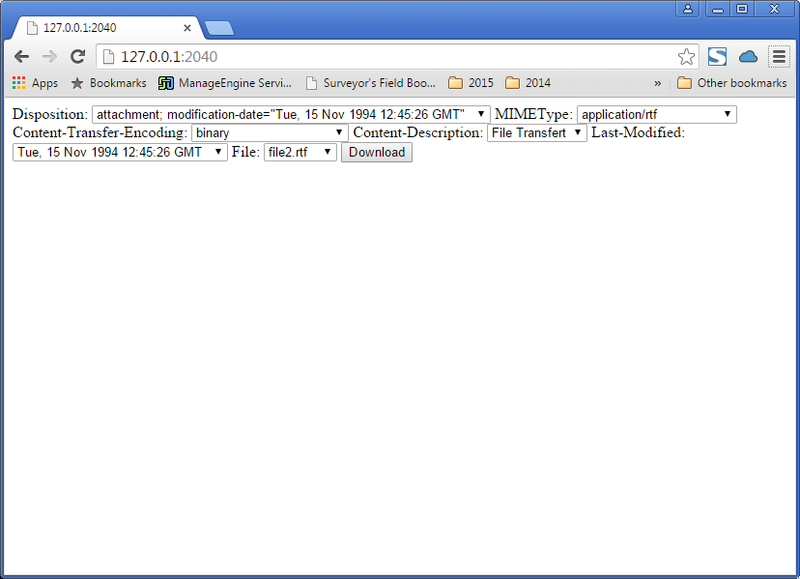 The server will listen for requests on port 2040 and can be accessed through 127.0.0.1 or localhost. Please use the former if you’d like to observe the delivery headers for yourself. The server provides two options specifically relating to content delivery. I have drawn from RFC 2616, Hypertext Transfer Protocol — HTTP/1.1, and RFC 2183, Communicating Presentation Information in Internet Messages: The Content-Disposition Header Field. At the first attempt, the Last-modified header could not be set manually using a Set() command in my code. The Golang HTTP server code is too intelligent and ensures that this is set, and more importantly ensures that it is set accurately. As such, I modify the date on the server directly n.b. volatile! The mechanism is similar to using the touch command in Linux, encoded in a native Golang function. Ultimately, whatever date I chose on the server, whatever header I set – I could not influence the behavior of the browser (Firefox or Chrome, Windows or Linux) – a negative result. But it allows me to draw a line in the sand at the delivery end of the spectrum. I wanted to share a negative result. I wanted to share my thoughts, and to open up a set of questions, to understand who else is asking them, to orientate my thoughts to understand if it is something to keep in mind in future digital preservation requirements gathering sessions. What does the concept of a last-modified date, associated with the object, mean in an archival context? Is it still important when externalized in other metadata? Further, what does the concept mean (a single date attached to a single object) in the context of larger collections of objects? E.g. ingested from an EDRMS? Perhaps this bears more relevance in systems that put the burden of rendering onto the user? If we could introduce support for this in standard web-browsers, how, when, and where do we manage the modified date inside the preservation system? – Managed movement from deposit through to delivery (micro rsync like operations?) or do we repatriate the object with the date on delivery? We have the ability to control, or at the very least, understand, and also document, each part of the digital preservation lifecycle if we choose. At the beginning of the development process it is easy to get wrapped up in core feature development – the absolute must haves like continuous checksum monitoring; and later on it is possible to get wrapped up in more theoretical aspects of technology watch and preservation planning while also fighting to get the first transfers into the system. But a preservation system supports other functions, including, usually, an archival function, and a large number of end-users, who will have different use cases. It is an archive in the purest sense and enables delivery of content to those users. One use case, for a government archive – demonstration of provenance is of utmost importance. Though, this is a very specific use case. We do have a record in externalized metadata that describes the provenance of a record. In concert the two will likely be enough for most users. The repercussions of not preserving date on delivery seem to be minimal as it doesn’t look to be happening in practice in the systems out there, including one of the primary options for digital preservation. If we decide that we need this functionality in future – how do we approach it? First, it needs to be included more often in user requirements for digital preservation systems. As well as that, the browsers that form a large part of our delivery infrastructure will also need to be looked at – does anyone want to help me write an RFC to see another content-disposition option added into the standards for archival content?